François Xavier ce jeune camerounais avait face à cette opérations la semaine dernière sauté du deuxième étage de son bâtiment avant de se briser la hanche, et transporté par hélicoptère aux urgences ! Cette fois, une information encore plus radicale selon laquelle le President Camerounais aurait signé un ressent accord bilatérale avec l’Allemagne visant à rapatrier tout Camerounais vivant en Allemagne en situation irrégulière dans un délai impératif et sans procédure relative au droits de réfugiés , sème une fois de plus la panique, les camerounais se retrouvent une fois de plus comme des marchandises à vendre par leur gouvernement ! 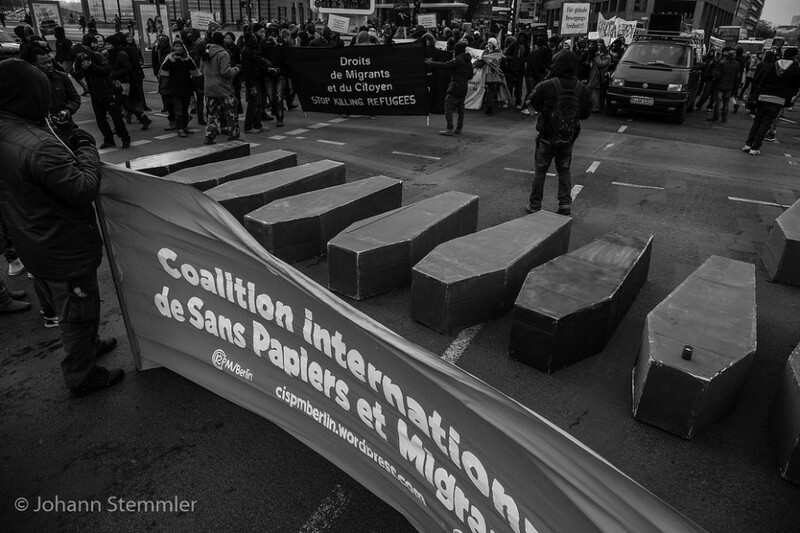 D’après nos informations, des groupes anti racistes auto organisé se rencontront demain à hennigsdorf pour protester contre les déportations car c’est demain mardi, 21 juillet qu’est prévu cette vaste opération militaire de déportation. 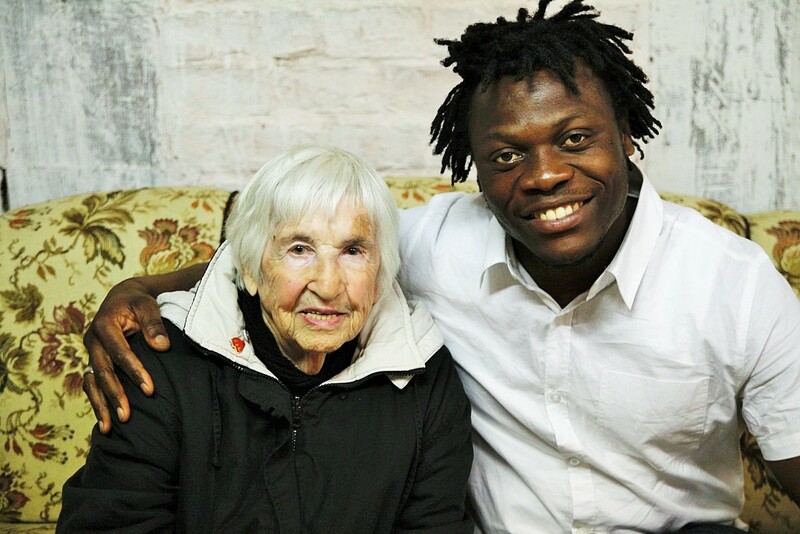 Esthers Bejarano with Geraud , born 15th December 1924 , one of the survivors of the Auschwitz womwn’s orchestra. I welcome the presence of everyone for the transit-Festival 2015 in Klempenow. I am very pleased to participate as a guest of honor, I think it is a sign of humanity on the part of the organizers and a big step towards equality of people of diverse backgrounds. I would like to participate in the events organization and especially the political discussions because today peace is built through dialogue. In the case of Germany, it’s a great country with great political aspirations, but how can it keep a balance if it does not correct the mistakes of history! A common fear remains in Germany and it is up to politicians to reassure citizens and not to traumatise them! I would also like to discuss the topic of political refugee in Germany. For example, this morning I was going to answer the invitation of Transit Festival here in Klempenow with four of my friends, I was surprised to find out that two of them were deported very early this morning, to Spain. Another example is my friend Francois Xavier Mbenlemd. He is a friend of Cameroon and when he was trying to escape when the police entered the building one morning, they threw him from the second floor of the building once they had entered his room with the intention of deporting him, The fall broke his spine. They had to call the helicopter to take him to hospital. This happened three days ago and he is still suffering at the hospital in Hennigsdorf. When a political system creates victims of this kind it is not political. This is war against the refugeese in allegorical form. Most of the Germans are a good people and together we can succeed with small actions and expressions of kidness like the transit-festival. This is a great example! I thank the organizers and wish them and all the guests an amazing time. To change the world we must change our hearts as the future of our world is in our hearts…. Gegen 9.00 Uhr am heutigen Morgen hat Kathrin (Ärztin) per Fernglas vom Ausguck aus ein Flüchtlingsboot entdeckt und entsprechend die Crew informiert. 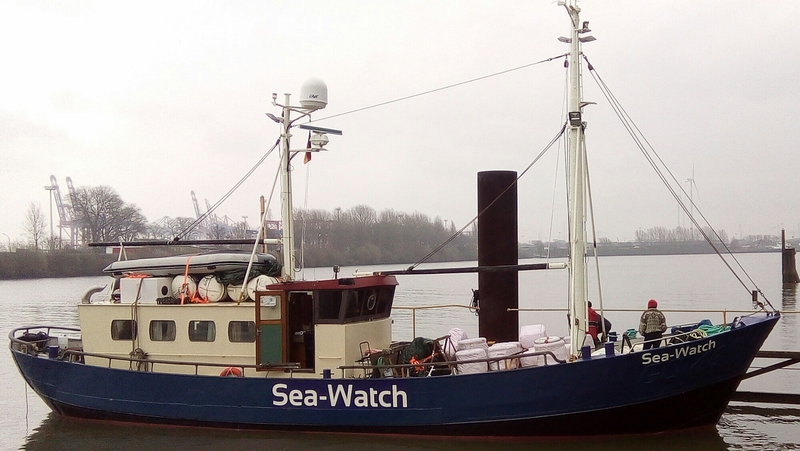 Wir sind anschließend mit der “Sea-Watch“ auf etwa 1,5 Meilen an das Boot herangefahren und haben gemäß der Vereinbarungen die Rettungsstelle MRCC in Rom informiert sowie das MSF-Team der Bourbon Argos kontaktiert und ihnen die Koordinaten. durchgegeben. Aus der notwendigen, zum Flüchtlingsboot stets eingeplanten Distanz heraus, wurde das Beiboot zu Wasser gelassen. Besatzung: Meik als Steuermann sowie Frank und Max als Mediziner und einen arabisch sprechenden Kommunikator. Beladen wurde unser Beiboot mit 20 Rettungswesten sowie Trinkwasser. Die Situation, die wir vorfanden, war sehr angespannt und unruhig, aber als sicher einzuschätzen. Die Flüchtlinge konnten ohne SAT-Telefon keinen Notruf absetzen und hatten die Orientierung verloren. Zudem hatte das Boot einen Motorschaden. Wir waren froh, das Boot gesichtet zu haben. Die Flüchtlinge aus dem Sudan, Somalia, Nigeria, keine Syrer, hatten große Angst vor unserem Beiboot, weil sie zunächst die libysche Küstenwache vermuteten. Wir belegten mit unseren Papieren unsere Absichten, ihnen zu helfen, blieben aber auf Abstand. Wir entschlossen uns, das Wasser und die Rettungswesten nicht auszuteilen, um keinen Streit zu schüren. Mit dem Wissen, dass die Bourbon Argos in etwa 90 Minuten vor Ort eintreffen würde, und den ausgezeichneten Fähigkeiten von Frank und Anton, beruhigend auf die Geflüchteten einzuwirken, sollte das die richtige Entscheidung sein.